The publishers welcome your views on God's Triangle, whether they are favourable or critical. Email them here. For legal reasons, all contributions will be moderated before publication. God's Triangle was a seriously good read. I was a bit more sympathetic than the author to the reluctance to publicise information about the divorce and the failure of the newspapers to cover it. I'm sure the Baptist Church was influenced by the possible financial ramifications but it is also possible that the people who made the decision were concerned by the impact widespread publicity would have had on your Great Aunt Florrie. Given the lack of knowledge of her condition at the time she must have lived in a state of permanent bewilderment. I sympathise with the decision not to make the divorce proceedings public at the time, but fail to see the need to enforce the decision 80 years after the event. Well done for pursuing the matter and for a well-researched, informative and very readable book. - AT, Windsor, England. I was really impressed [with God's Triangle]. It is an interesting read and highly descriptive of the area of missionary activities in foreign lands .They often reaped what they sowed in their attitude to other religions. You have both spent an enormous amount of time on the book and are to be congratulated for your effort. Your tenacity has been rewarded. - TN, Leopold, Victoria, Australia. The story has all the elements of a great movie: modern-day journalist sleuth who wont be thwarted -- not even by Melbournes Supreme Court. Full comment here - Jennifer Chamberlain, Auckland, New Zealand. A tale of tragedy and circumstance in a personal family history. Heartfelt and considered. - Review by Tracy Burgess, The Australian Atheist. Richardson was ruthless in his pursuit of the facts and uncovered a horrifying account in which no one came out favourably. - Full review. Beth Pevsner, Durham University, County Durham, UK. I don't think there was a conspiracy to cover up the scandal - it was just the thing [for Freemasons] to do at that time. - An anonymous Freemason, Melbourne, Australia. Writers of family histories could learn much by reading this book if only to glean tips on how to keep one's readers on their seats and wanting more. - Blonde Lawyer's full Amazon review. It's a very, very strong love story, and it's got a great setting. - Lauren Mitchell feature, Bendigo Advertiser, Australia. I do not think that I have thanked you for your excellent book. I read it in two days (which is very good for me as I am not a reader as such). Within our genealogy group your book is in such high demand that I ordered one from the library and both books are doing the rounds, with high praise from all who have read it so far. We are looking forward to watching the movie. -- JW, Wonthaggi, Victoria, Australia. I have just finished God's Triangle. Great reading. Fascinating. Honest. Amazingly respectful of all perspectives. Sensitive. Real. Down-to-earth. Yes, with universal relevance. Most topical. I know I've already said honest...but I think honesty is the hallmark of this enthralling read. I literally only put it down to eat my dinner (that my kind husband was bullied into going up the street to buy for me so I could keep reading!) - JW, Melbourne. What an extraordinary story, and really quite moving. Lots of congratulations on all the painstaking research that went into the telling of it. - PD, Gerrards Cross, England. God's Triangle deserves a much wider recognition as I believe it to be a very important piece of work. - Review by Graham Mytton, Dorking, England. I must say I thoroughly enjoyed it [God's Triangle] and am particularly impressed by the depth of your investigation. I had never really thought of the consequences for the freshly-converted Muslim or Hindus within their communities and the arrogance of the Missionaries who I had always assumed had gone to these places to alleviate the famines etc and provide education. At the end of the day, one has to have some sympathy for Frank, who must have had the shock of his life. In today's world of wall-to-wall media where we all know everything about everybody, it is difficult to imagine the early days of the early 20th century where just about everything controversial or distasteful was suppressed. I thought this was a fascinating story (and wonderfully well written, if you don't mind me saying!) which held my interest throughout. - NL, London. God's Triangle, written with compassion and insight by an atheist, invites the reader to see both sides of what is still today dividing communities world-wide. Ian Richardson's preface to his book immediately grabbed my attention. Ian's sensitivity to the subject matter was paramount. He didn't condemn the people. He condemned ignorance and the damage done by it. - Virginia Ballhaus, Queensland. Full review. Family tale a great read. - Sue Turpie, Bendigo Advertiser, Bendigo, Australia. What a tale! - Tim Ferguson, author, comedian, TV presenter, Australia. Absolutely riveting. Well-written and excitingly plotted. Not only a really good detective story but a sensitively written book in which, though I know you find these people's systems of belief incomprehensible, you resist taking cheap cracks at them and let the narrative speak for itself. - TCDL, London. 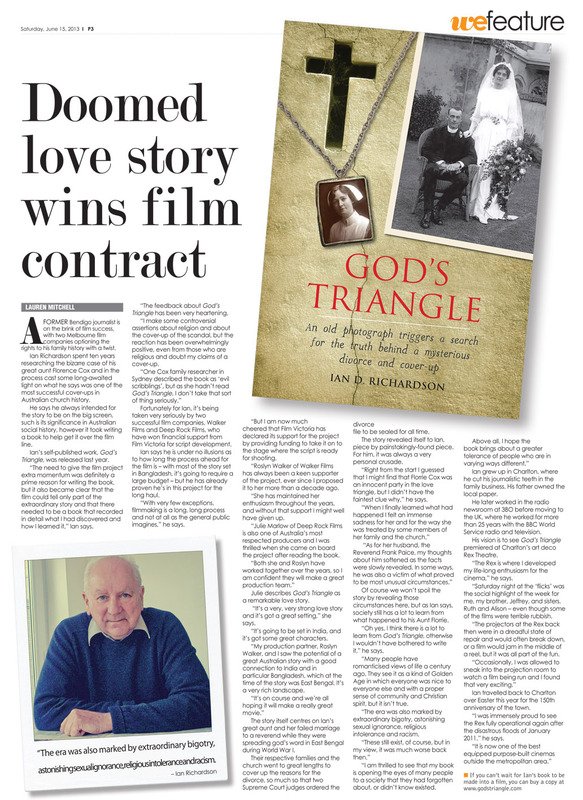 Thrilled that Ian Richardson's family history book God's Triangle was picked up to become a movie. - Ancestor ebooks, United States. What a fascinating book God's Triangle is. It's an extraordinary story -- not least of all the lengths you went to on your poor aunt's behalf to get her story right, and the reason finally uncovered about how she found herself in such a situation. - Pippa Gwilliam, Oxford, UK. Beautifully written and an important story to tell. - Elaine Race, Melbourne, Australia. I found it very absorbing and could barely put it down. Quite a level of suspense and anticipation and a good balance of commentary and quotes from original sources. I think God's Triangle would make a great movie. - EP, Ballarat, Australia. I not only loved [God's Triangle] but was absolutely gobsmacked by it. As the mystery deepened it had me totally intrigued. The end story was amazing in every way. I just hope that the film does it credit. - AS, Melbourne, Australia. Really enjoyed the book. Thank you. I think you hit exactly the right note with Florrie. What a desperate life she must have had after the divorce, and with no one to confide in. Just awful. - GC, Auckland, New Zealand. I actually liked the narrative part when you were in Bangladesh, a subtle tie into your background as a journo - a nice added layer. - SG, Hobart, Tasmania. I've just finished God's Triangle. I hadn't intended to read it till I'd finished David Copperfield but I started to read the introduction and then couldn't put it down. It's a great piece of work. - RE, London. Just finished reading God's Triangle and I really enjoyed it. I had NO idea the complexity of your research even though we have discussed it over the years and I should have known. It was a fascinating detective story. It was so interesting to see it slowly uncovered. I particularly enjoyed your trip to Bangladesh. And was amazed that the son had no idea his father had been a missionary and you had to show him the only photo of his dad's first marriage. - RA, London. What a story! And how well you have told it. - JT, Melbourne, Australia. I thought the book was great - put together very well - and the journey of discovery kept me intrigued. - GT, Bendigo, Australia. I found it very interesting and enjoyable even though I worked out Florrie's problem before it was revealed because I had recently read a magazine article about the condition. The book gave the impression that you had a bias against organised religion. Despite that, I still wanted to continue to read it to the end. -- MS, London. A very good read but a really tragic story. It's an eye-opener and quite disturbing. You seem to have left no stone unturned in eking out the truth of it all. I hope the book-reading public give it the attention it deserves. -- BR, London. I do not accept your judgement that the action of the missionary authorities was a "cover-up". I am sure that the attitude taken, not to tell the story, was adopted out of sensitivity to all the parties concerned. -- GBB, Sydney, Australia. My Nana really liked it. She thought it was wonderfully put together. I started to read it late last night and was so fascinated I kept going until I finished at one in the morning!! What an accomplishment. I am amazed at how much time, effort and money you have put into all your research. - KB, Kyabram, Victoria, Australia. I have not read your pages as you are scandalous with the title before you start. Take your book to the rubbish. Send me no more of your evil scribbling. - TB, Sydney, Australia, a Cox family genealogist. Have completed reading God's Triangle with great interest. It certainly has been well researched by you over a number of years. There were no winners in this sad tale! Having known of Hedley Sutton by reputation as an educationalist, his participation in this saga does not show him in a "good so-called Christian light". - AM, Melbourne. So tragic but an eye opener into what life must have been like in the early 1900s -- Rachel J, Melbourne, Australia. First book I have read right through for about 30 years. Could not put it down until I had finished it. Great. - IDN, Bendigo, Australia. 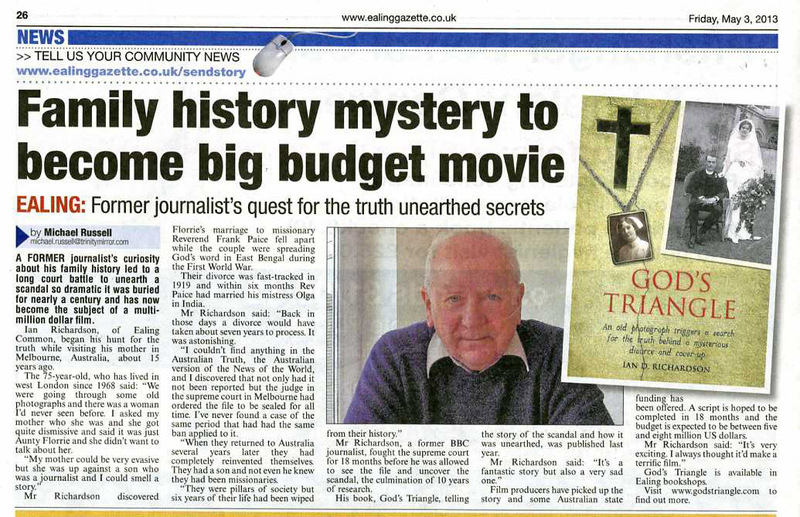 Family history mystery to become big budget movie - Michael Russell, Ealing Gazette, London. I must say I found it a real page-turner - kept me awake into the small hours, wondering what happened next. - RS, London. I've just finished reading your book -- fantastic a real whodunnit. Well done. A great read. - PM, Sydney. What a wonderful achievement. Your continued research over such a long period brought you many answers. It was a sad story - to think of Aunt Florrie and the sad and lonely life she had without understanding and compassion. - MS, Melbourne, Australia. 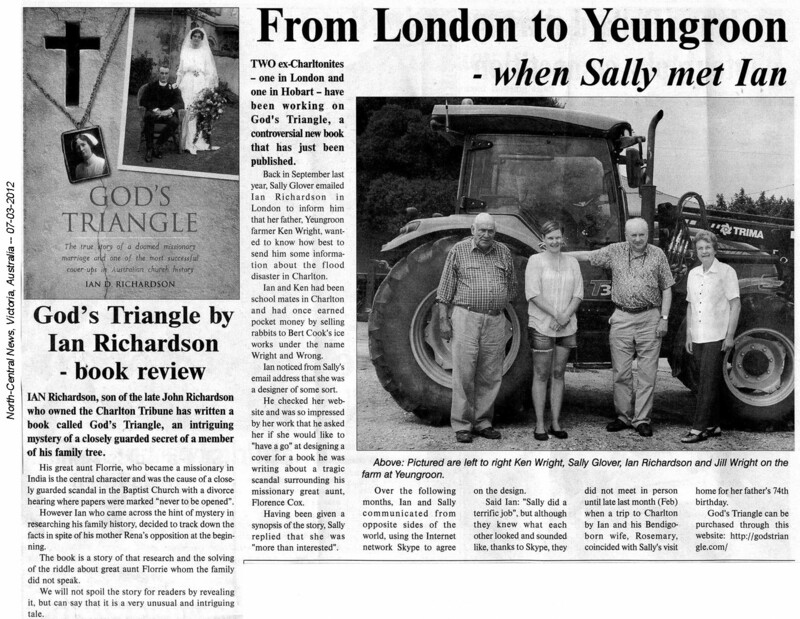 It [God's Triangle] was an enthralling, if very sad, read. And a fabulous piece of detective work. - EB, London. I thought it was an amazing and fascinating story. I thoroughly enjoyed reading it, but obviously found Florrie's predicament very sad. It was a real eye-opener. Your perseverance in trying to unfold the truth is admirable and your diary certainly provided an excellent read. - KP, London. I found it a fascinating story. It must have been pretty devastating for your great aunt at the time. It also much enlightened me, as a (lapsed) childhood Baptist, about the efforts of the movement to spread the word in the Third World. Looking forward to the film. - WT, Newcastle, Staffordshire, England. Just wanted to tell you how much I enjoyed reading God's Triangle. As a keen amateur genealogist I was very interested in how you went about your research. I have also found older relatives very uneasy in what ones motives might be in digging up things that may have been embarrassing or scandalous even at the time. The story of Florrie Cox is a certainly a very sad one, her life would have been different with today's medical knowledge, but on the other hand another couple of centuries earlier she might have been declared a witch! - SS, Kelvedon, Essex, UK. I'm not letting my husband have a 'go' of the book till I have absorbed my second read. You have excelled, and I can only say that if you had chosen law as a profession, I would be glad that I wasn't on the opposite side of the courtroom to you with your attention to every detail. - CB, Ballarat, Victoria. I found it [God's Triangle] quite fascinating and I have to say that I felt so very sorry for poor Aunt Florrie. What an awful time she had and no-one to understand and help. - PR, Melbourne, Australia. What an amazing story ... and what an amazing example of extended cover up and lies. Attitudes of shame and secrecy are almost understandable in religious organisations where divorce was considered unacceptable but why did the courts keep everything secret for so long when you were making perfectly legitimate requests? An impressive piece of research with worthwhile results. - JE, Goucestershire, England. I think it's brilliant that you've pursued the quest with such dedication. Well done. I enjoyed reading it very much. - MS, London. A magnificent achievement. God's Triangle is not only a fascinating tale, but a very valuable social document and the result of some brilliant and painstaking research. It is above all an honest book and I cannot praise it highly enough. - JGT, Dulwich, London, UK. Poor Florence probably never knew what was different about her or why. I feel for him [Frank Paice] also. He would have been looking forward to his life with Florence and it could never work out. I think I can see how Olga muscled in. It was a good read. I liked how it was played out, revealing your evidence as you found it and showing the conclusions that you made at the time with the evidence that you had. You are a very persistent and, dare I say, thick skinned person. I am also a persistent person, but I'm not sure that I would have been thick skinned enough to push as hard as you did. - KM, Melbourne. I just think of the dignity of that woman [Florrie Cox] now that the information is in print, and how humiliating it would have been for her. I don't understand the cover-up. Just because it didn't make the [news]papers didn't mean it wasn't dealt with. I learned more about you than the information you were researching. - Extracts from a letter of complaint from New South Wales, Australia. I thoroughly enjoyed your book - very readable with its detective-style leads and trails, triumphs and disappointments (one has to admire your old-school journalistic persistence.) All in all, a tragic tale, thoughtfully and movingly unfolded, which tells us much about a time, place and human dilemma which turn out to be not so very distant and obscure after all. - TL, Dalston, London. A good read, especially the investigation. I couldn't put it down. - RT, Sydenham, London. God's Triangle...certainly bears out the adage that truth is stranger than fiction. 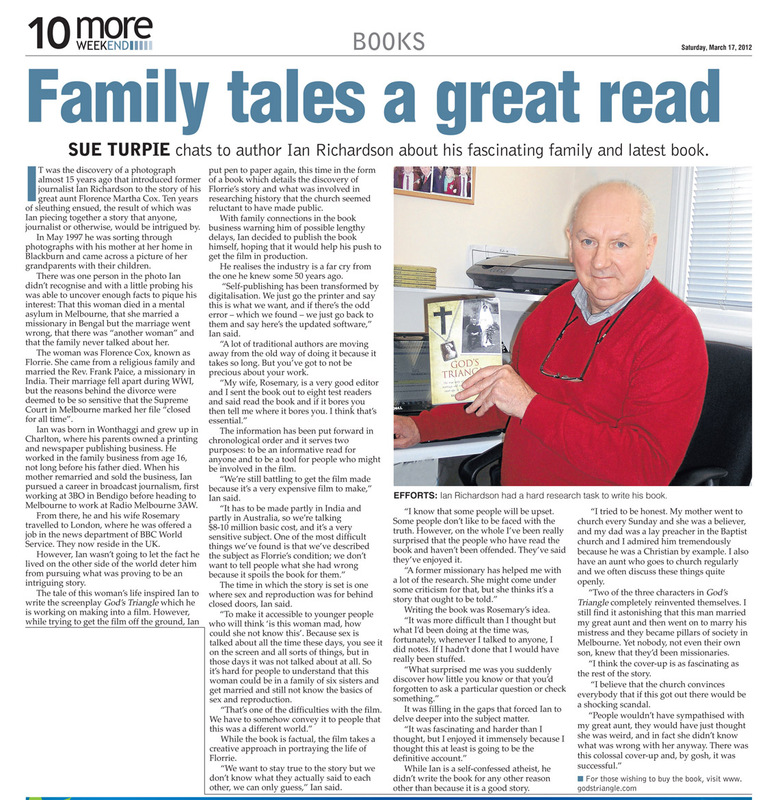 - Review, Buloke Times, Victoria, Australia. An intriguing mystery of a closely-guarded secret of a member of his family tree. - Ella Ebury, North-Central News, Victoria, Australia. I have just completed reading the story of Florrie Cox, and appreciate the time and effort into the research. Your handling of the story and the detail was great. Your book also brings up the interconnection and power of the likes of the churches and freemasonry, still relevant today. - MD, Horsham, Victoria, Australia. I was fascinated from the first page. So much of it is familiar, the places and the names, Carey and Hume's etc. And Richardson's writing is so good. - BB, Ballarat, Victoria.